There was one element of Star Wars Rebels‘ “Twin Suns” that eluded interpretation. Over the course of my multi-part close read, with every ridiculous theory I crafted for the episode’s name, I could not place it. Why were there so many shots of eyes that looked like the suns? Maul’s eyes were the right color. Obi-Wan’s were similar to the blue of the twin moons, which served as a stand-in for the suns at night. There was a close-up of Ezra’s eye that made the pupil and the dot reflection look like the suns across the blue “sky” of his iris. Even Chopper had a moment where he was cropped by the frame so that only two of his optics were visible. 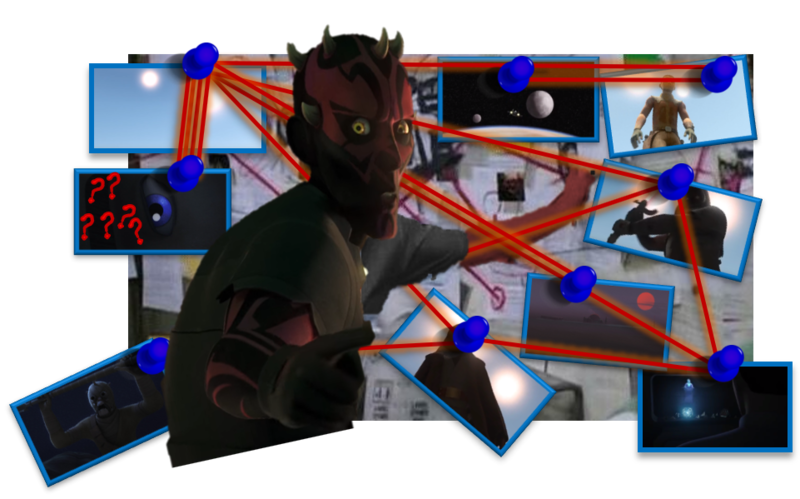 “Twin Suns” did use eye close-ups and point-of-view shots to establish whose perspective the audience was to engage with, so these decisions were not wholly without reason. And yet I still could not make the connection to why these eyes resemble the suns, almost deliberately so. Then I realized I was thinking about this wrong. I was trying to work out what it meant for the eyes to be suns; what I needed to consider was what it meant for the suns to be eyes. If you want to say that I’ve gone too far and that “Twin Suns” broke me, well… Yes, I suppose that is fair. I still ask that you hear me out. This is about more than my obsession with a single cartoon episode. “Twin Suns” is a small story that perhaps is never shared beyond the four people who lived through it, which makes the events feel even smaller, more intimate. A story that will eventually be lost to the sands of time. But if the suns (and moons) truly represent eyes, then this is a story that was witnessed, a story of which someone made note. The Force is the obvious culprit here. Powerful embodiments of the Force have displayed this ability before: the Priestesses who watched Yoda, the Mortis Force Wielders who watched Anakin. However, there’s also the possibility for the witness to be a simple mortal as well. How many have ever stepped into the World Between Worlds of the Lothal temple? Could it have been someone on the other side of a portal, looking through? Or perhaps the eyes belong to someone a little more ethereal. Maybe the witness is us. Maybe we were the twin suns all along. If you want to say that “Twin Suns” has clearly gone straight to my ego, well… Yes, I suppose that is also fair. But “Twin Suns” is not the first overlap of the Force and the audience occupying the same space. In the first article I wrote for Eleven-ThirtyEight, I discussed one of Star Wars’ archetypes: the Arbiter of Compassion. This archetype is one who tests the heroes on their quality of character. These arbiters help guide others along better paths, ever closer to the light. So it’s only fitting that the arbiter of the prequel era, where the descent into darkness begins, is gutted before our very eyes. Qui-Gon’s death and the shrouding of the Force in The Phantom Menace means that there is no arbiter left in this era of Star Wars. As such, the arbitration of whether or not a character passes the test of compassion is left up to the audience, who has no power to guide the characters to better choices. 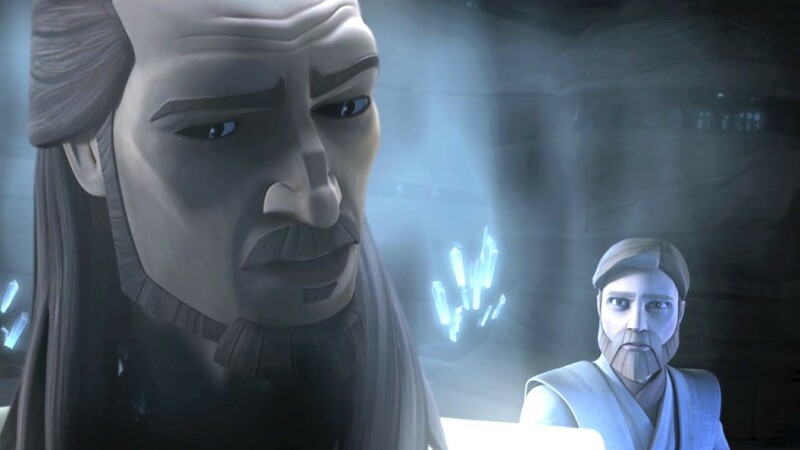 Almost as if we are Qui-Gon himself: unable to manifest physically, and forced to watch the Jedi and the Republic fall apart, watch Anakin slaughter a village, watch an unjust war twist good people into collaborators, and watch test after test of compassion failed or denied for the “greater good” until evil wins. Adam Kranz discusses a sibling to this idea in “The Force and I Have Different Priorities”, but what I want to examine goes beyond authorial intent. This is the weight of audience interpretations. In Star Wars, there is a power in simply being a witness to an event. A story has value because it was seen. There are many tales in The Legends of Luke Skywalker and From A Certain Point of View – perhaps the entire concept of both books – that can be read this way. After all, who is Beru talking to? But one story makes this power of witness explicit. “Stories in the Sand” was written by Griffin McElroy, whose first foray into crafting fiction was also about the power in remembering and being witness to a story. That sensibility is on full display here. 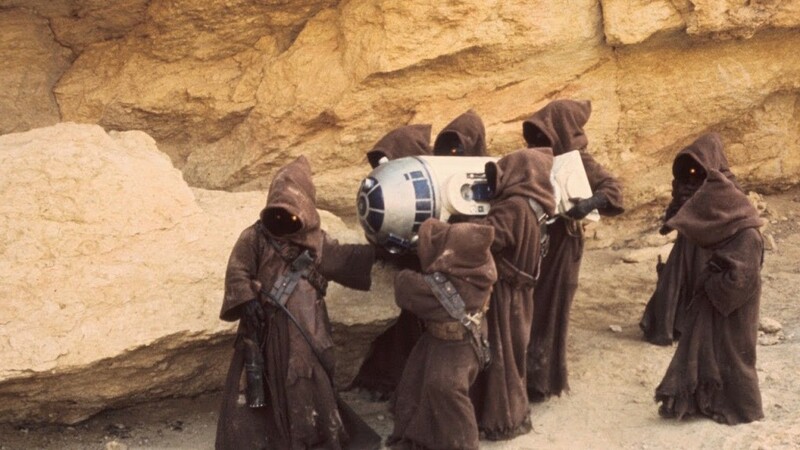 Jot is a Jawa who adores stories, but he must destroy all that he comes across as a part of the salvage process. And because he is the final and perhaps sole witness to the last memories of these droids, he feels an almost sacred duty to remember them. He watched the stories with rapt attention, trying to memorize each and every detail, making silent promises to remember them to the best of his ability. He had to remember, because after viewing each memory core, Jot gently removed its casing and carefully detached its internal battery, instantly erasing its contents in the pursuit of optimization. For a significant portion of the tale, we are Jot, squirreling ourselves into hiding to catch a glimpse of a galaxy far, far away. 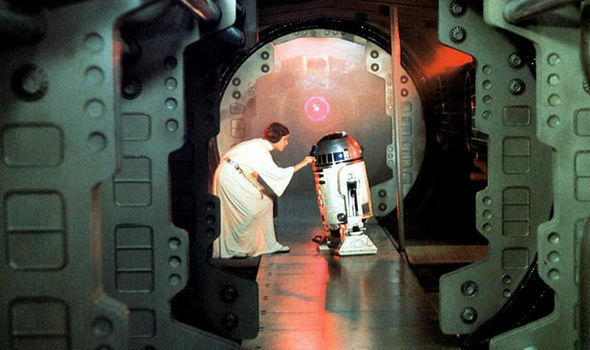 Then R2-D2 comes down the salvage line, and Jot realizes the galactic importance of the story in his hands. The warm security of his secret compartment drained away, and for the first time since discovering the gap, he felt completely exposed. He felt watched. In this moment, we are not Jot. We are the multitude of eyes on him. Due to McElroy’s penchant for weaving the meta and the narrative together, I truly think that he intended this interpretation. We all know Artoo’s fate, but we don’t know what Jot will decide, so we watch. Under this scrutiny, Jot seizes upon his role in the story. The witness becomes a participant by deciding what stories are worth remembering. The thought of carrying out the data wipe didn’t even cross his mind. Jot didn’t believe himself worthy to participate in this droid’s story. He certainly did not deserve to bring it to an unceremonious end. By our witness, we change the story. I don’t just speak about the influence we might have on Lucasfilm or even the transition some of us make from fan to creator. I speak of fandom itself. How many different messages, theories, and fanfics were crafted from The Last Jedi alone? How many different stories did each of us witness in that single movie, regardless of the message Rian Johnson was intending to communicate? I don’t believe fully in the Death of the Author but rather that authorial intent and audience interpretation are symbiotic even when they pull into tension. Fandom is born in that tension, and what we speak from it determines the stories that are remembered. Johnamarie Macias of The Wookiee Gunner is forever championing one Ezra Bridger. Constable Zuvio is single-handedly kept from obscurity by one dedicated podcaster. I spent a year and a half of my own life pouring all my writing skills into a study of “Twin Suns”. The team behind A Star Wars Comic celebrates a multitude of characters by telling the tales of their little moments. And all of us bend our ear to hear the voices of Loan (Kelly Marie) Tran and Ahmed Best. The galaxy of Star Wars may never know that Cassian and Jyn embraced, finding home in their final moments, but we do. The galaxy may never know the infinite kindness of Obi-Wan cradling Maul until he passed, but we do. The galaxy may never know the depth of Beru Whitesun Lars’ love for Luke, but we do. We see them, we hear them, and we decide they should not be forgotten. We are the twin suns, bearing witness to even the smallest of stories. We’ve seen things people wouldn’t believe. Attack ships on fire off the horizon of Yavin 4. We watched hope shine in the dark beneath Scarif’s gate. All those moments that would have been lost in time, like ashes in the wind, saved by our remembrance. If you want to say that “Twin Suns” has made me too melodramatic about all this, well… Yes, I suppose that is fair too.